The morning of the hike dawned – we looked apprehensively out at the sky, would the weather be kind to us? 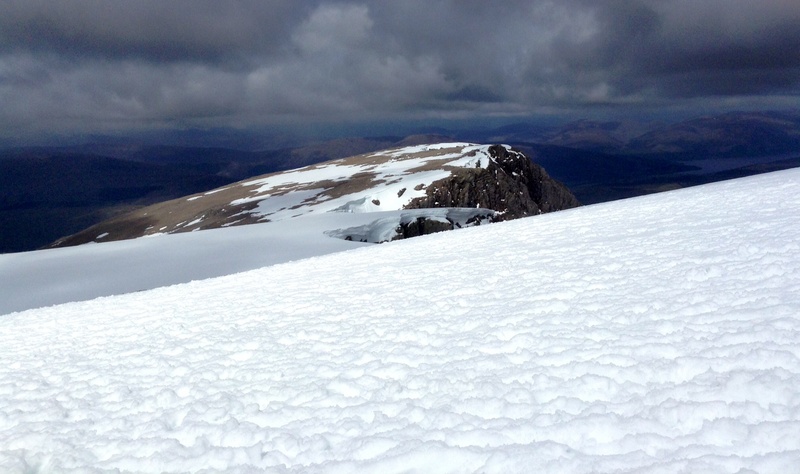 A thick white cloud clung to upper end of Ben Nevis, but it looked clearer than it did the day before. 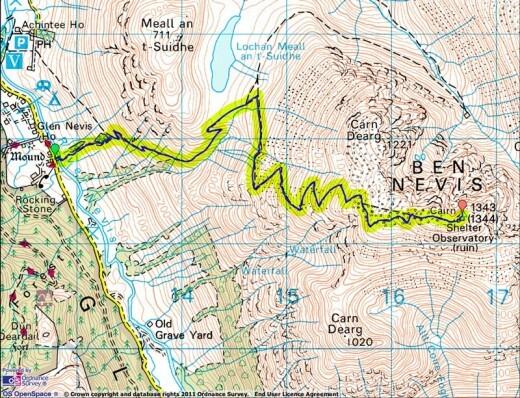 We stocked up on a nourishing but not too heavy breakfast, and plotted our route on the OS map. We left our contact details with Pat at the reception desk – a precaution just in case any of us went missing…Did we have a map? Emergency food supplies? Compass? We gave a confident affirmative to his questions. OK, but after that the path is straightforward enough? Well, no. 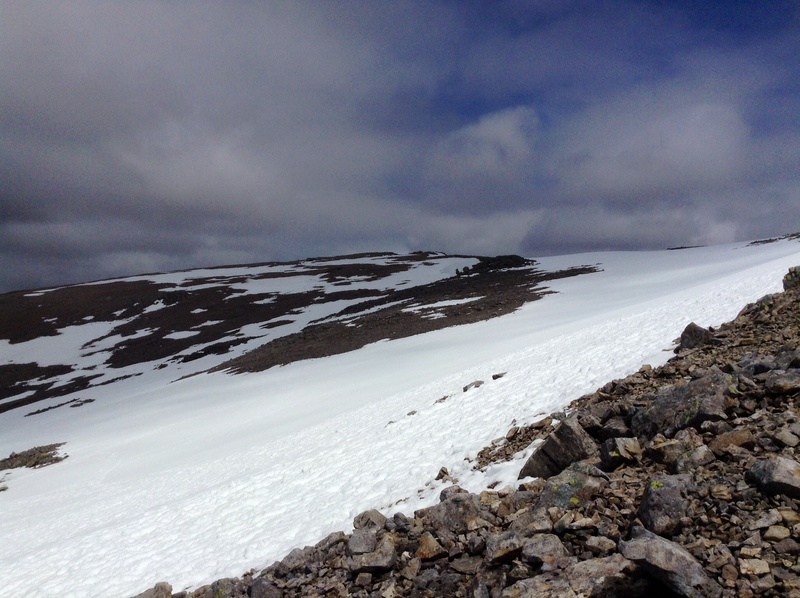 The previous 2 weeks had seen the most unpredictable weather in recent years – the snow should have lifted by now, but hadn’t, and as we got closer to the top the way would be unclear. Right. So with that encouragement we set off. 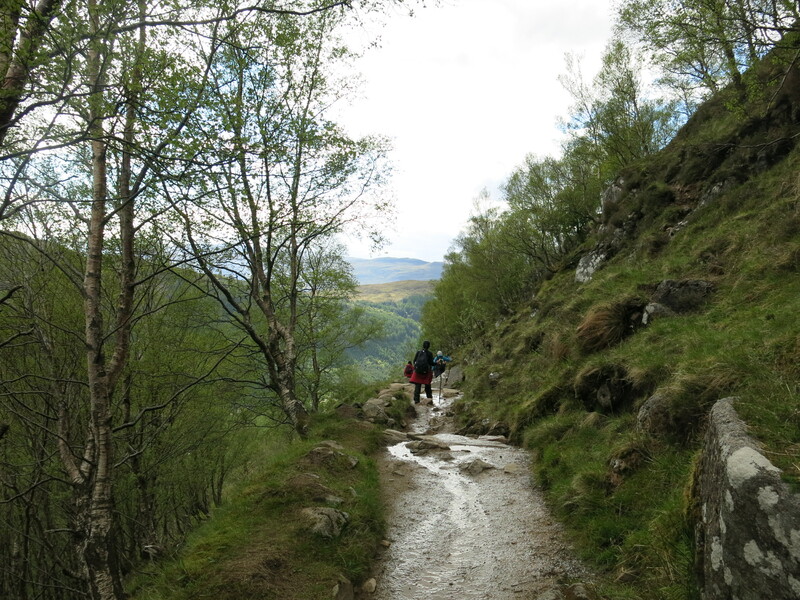 As we hit the ascending path, another hiker – fair to say he was more senior in age – strode down the path. “Oh, there’s a lot of snow cover at the top, a bit hard going” he declared cheerily. It was 9.15am; this man had already climbed and come back down the mountain, and didn’t look like he had even broken a sweat. We looked at each other incredulously – we felt rather small at that point. On we went – our goal was to climb up this “short-cut” along the west face within 40 minutes. I should point out this was not easy. It was steep with no natural breaks. Also, it didn’t give us any chance to warm up properly, and so it was probably a lot harder than if we had hiked up a gentler gradient first – which is exactly the advantage you get from the official (and longer) start to the mountain track. There is a trade-off between the time you supposedly save going up the relentlessly ascending short-cut, and the energy you save going via the long route. We had to stop fairly often to catch our breath, which wouldn’t have been necessary via the longer route. Also I started to discover that my new hiking boots actually had worse grip than my still perfectly-functioning old boots – quite a frustrating discovery to make when you’re on a mountain. The sun suddenly came out in its full glory, its rays beat down on our heads and back making things more strenuous. Outer layers were shed, and packed into rucksacks, which of course made our load heavier as well. Second discovery – my brand new 30L rucksack, bought to make life easier, actually did a worse job at lightening the weight – it lacked the rubber mesh to shield your back, and lacked the straps to fasten around your waist: I had underestimated just how useful these were on my old 20L. So the moral of the story is: new does not equal better. It all sounds a bit grumble-grumble up until this point; and I’ll be honest it was a bit like that, but only inside my head. I knew it’d wear off. Sure enough, when we got to the end of the delightful short-cut (thanks Pat!) and converged with the official mountain track, we saw the pay-off: gorgeous views of the valley below, slowly brought out of the shadows by the rising morning light. Here we met many other hikers, coming up from the long-route. Cheerful ‘hellos’ and ‘where are you froms’ were exchanged. Most of the other hikers were from various parts of Europe, they seemed perplexed (in a nice way?) by us: a German-Ghanaian, two Singaporeans and less interestingly, me, a Brit. Ah, well! We also met a mother-daughter duo from Birmingham raising money for Cancer Research UK, and a gentle elderly couple from Yorkshire. We passed each other by quite regularly – as ever, the mutual encouragement and camaraderie that develops among fellow hikers was heartening. We crossed a little ford, the first of many mountain streams; on the opposite side we saw an impressive waterfall spring forth from the snow line. Our path continued to climb quite steeply and turn left as the Red Burn ravine opened up on the right. Above us the path snaked round a great spur of the mountain, and vanished from sight – we guessed this was the start of the ‘zigzags’ we had seen on the OS map, and reckoned the great lake, Lochan Meall an t-Suidhe, might come into view once we turned. We were right – after that the ground flattened a little and we caught sight of the lake ahead. 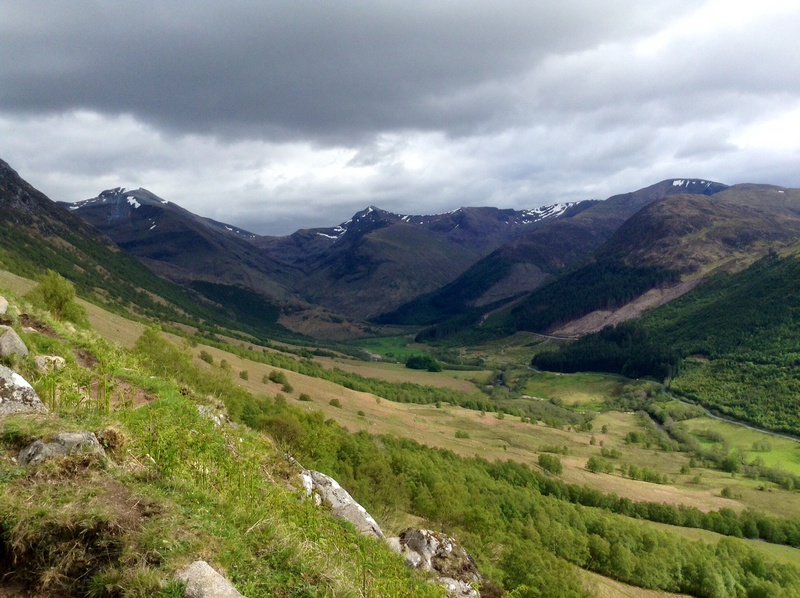 This was an encouraging view and gave us a chance to take a short breath, regain our energy and have a small snack. 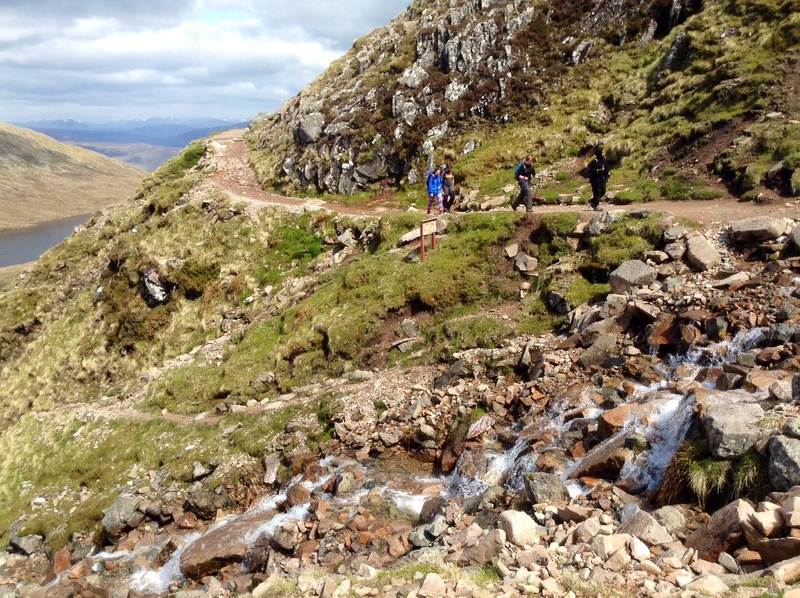 We could see the misleading path that Pat had warned us about – I reckon anyone with a map would find it hard to get lost and take a wrong turn, but then again we did have the benefit of good weather. The stony track continued to zigzag up, but we were a lot more refreshed and had got into our stride since the start; plus the sun’s warmth was broken up a bit with a cool breeze that grew stronger as we ascended. We kept going until we came across a waterfall. This was the halfway point. 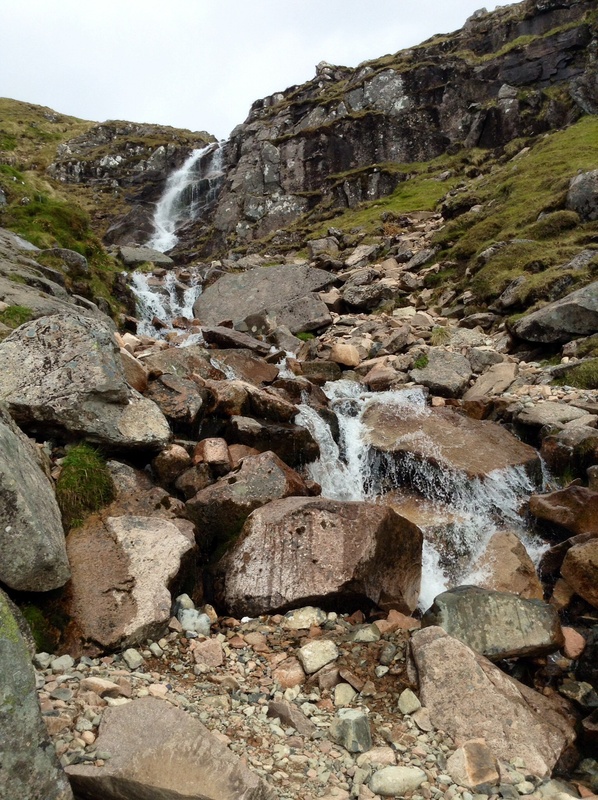 It was such a beautiful sight – crystal clear water tumbled down from high above, crashing into a rock pool that blocked our path, before cascading down way below. The only way to get to the other side was to cross the pool – some of the stones were jutting out, but most shimmered below swirls of water. I think one of the most serene and invigorating things we have in this world is the sound of flowing water; passing the waterfall was a moment of peace. Simple; life-affirming. We took a moment to absorb the beauty around us. So, onwards and upwards! Gradually we left behind the soothing sound of the waterfall, and instead became ever more aware of the sound of silence – still peaceful, but graver. There is a moment as you ascend a mountain, when you pass the point of pleasantness and shift into a higher, more single-minded gear that requires more concentration, exertion and dogged determination. There’s a job to be done, you talk less. It’s all about the mountain. Gone was the sound of birds singing, gone was the sound of tinkling streams – at this height, they had probably frozen over. As if to confirm this shift, we were suddenly confronted by the mountain’s snow line – a sprawling blanket signalled an oncoming change in scenery. Batches of hikers we recognised from before were coming back down – there is no way up, they warned us, it was too thick with snow. Cautious but not put off, we continued; the patches of snow became wider and deeper, encroaching ever more on the rocky track. Soon the path mingled with trampled snow, no longer separate, until at last it gave up altogether. A white desert yawned before us, the path completely buried – first we halted unsure how to proceed. Then we ventured forward into the snow – at the 4th step my boot, ankle and shin disappeared and threatened to sink even deeper. Not that way! Follow the existing tracks made by others, we resolved, as their steps had already flattened and hardened the snow a bit. We climbed in and out of deep footprints, making slow progress upwards. Since the ascent wasn’t clear at this point, we could have strayed off into some random direction – I read afterwards that people do indeed get tempted to turn left, ending up on the dangerous North Face where there is a sheer drop concealed by mist. But luckily there were some other hikers way ahead of us, and we followed their lead. On occasions such as these, the collective wisdom of others is to be cherished – we happily used it as a reassurance and guide. You’d be uninterested to know, by the way, that my hiking books were truly proving their ineptitude by this point. Grip had abandoned me, and I spent a lot of time slipping and losing balance. Mountain Warehouse ‘Hurricane’ range, I’m looking at you. As we trudged uncertainly through the snow, the silence and emptiness was really eerie. No sound, no other sight, just white desolation – meanwhile we knew the mountain didn’t care how we might reach the top or even turn back. We could be stuck there forever, and it would never care. 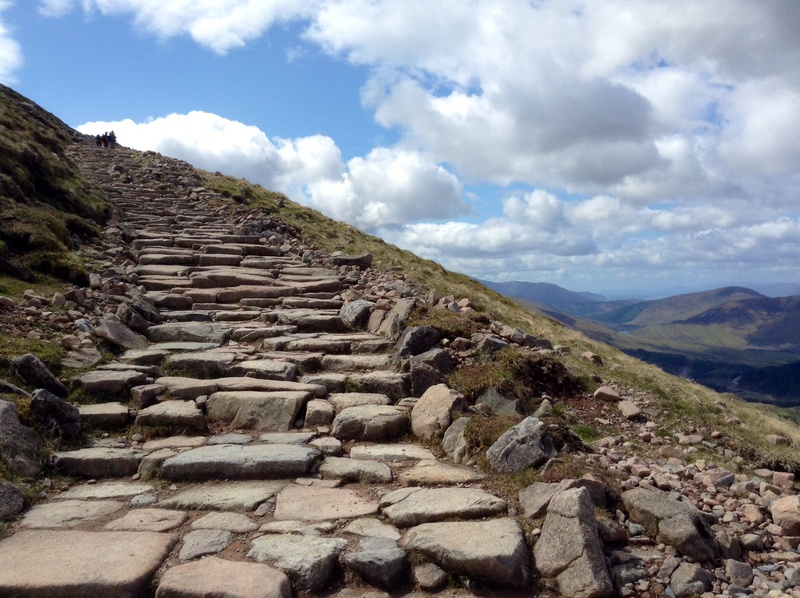 Ben Nevis owed us nothing. Vulnerability can be disconcerting. Or it can ignite an exhilarating sense of adventure – a puzzle to be solved and overcome. Variations of both sentiments bounced off the four of us, but eventually the latter took over 🙂 . Gradually we spotted more and more hikers ahead of us – there seemed to be a natural stopping point before a last long haul to the summit, just before the snow got even deeper. We saw lots of our fellow hikers from before, and gave each other the thumbs up. 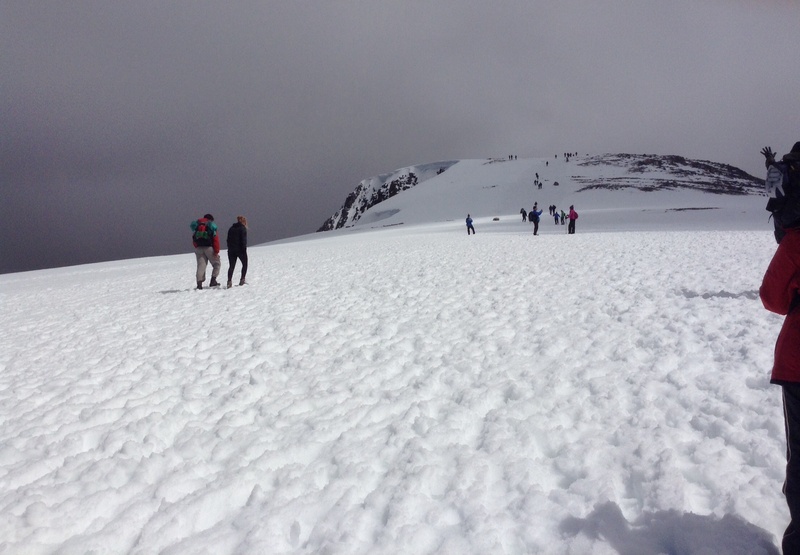 The last stretch was hard – dragging our legs in and out of the snow absorbed all energy. But the fact we knew we were close – about 2km uphill to go – and the brilliance of the scene all around us, spurred us on and cancelled out the fatigue. We were really fortunate – we had met with hikers turning back, telling us the cloud cover had made it too hazardous to get to the summit. But here we were with decent visibility. We could see the neighbouring peaks of the mountain range all around us, snow-capped, beautiful and perilous. While we were on the move, it felt deceptively warm – off came the gloves and jacket. The sun was shining down and reflected off the snow – it was so dazzlingly white that at one point, by some trick of the eyes, the outline of everything turned green and purple – like watching a 3D film without the 3D glasses. 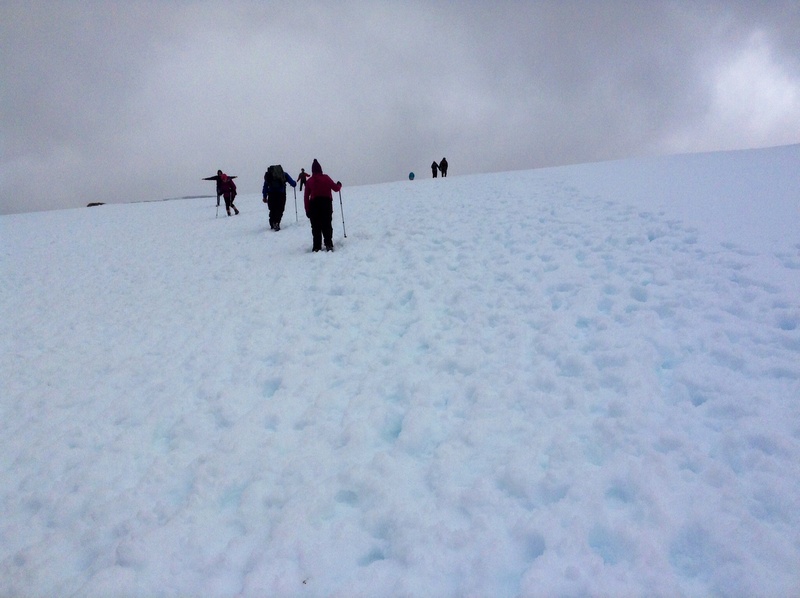 As we got nearer the top, the snow became a bit shallower and easier to cut through. 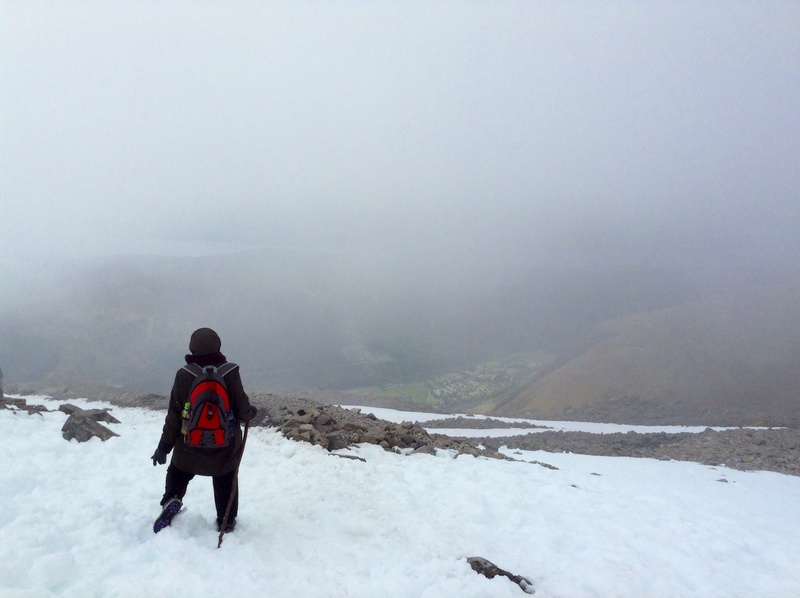 At long last, blinking, we could see the summit – the old observatory sunken in the snowdrift, other groups of hikers huddled up with celebratory drinks of tea from their flasks. We joined them before long: 2,45pm, 4,406 ft up. White. An otherworldly hush. It seemed we had an agreement with the mountain – you know that you are only there as temporary guests. The mountain is the dignified host – its hospitality is the magnificent view, the joy of achievement and the inner tranquility one feels. It silently assents to your presence there, but for a short while only. And then, you instinctively know it’s time to go. The warmth from the exercise starts to wear off, and you notice the minus-degree temperature biting at you. On this occasion, the clouds also gave us a warning. As we headed back down, the visibility we had enjoyed rapidly started to fade. 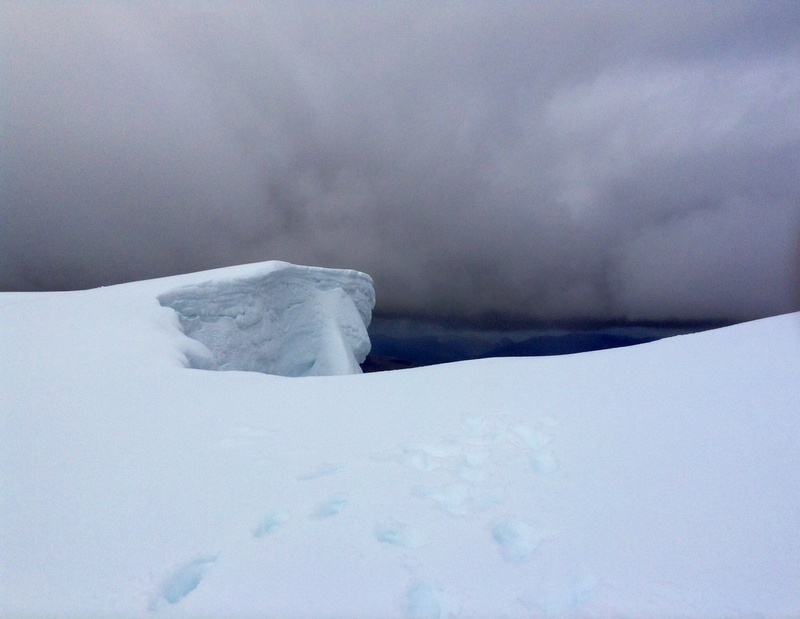 In front of us, a massive blanket of cloud hovered thickly and ominously, behind us it had already engulfed the summit. Snow began to swirl around us. We imagined how dangerous is would be to try and navigate the rocky descent in such a fog, and hastened our descent – we just about beat the mist. Coming down through the snow was, in fact, a lot of fun – the momentum carried us down; admittedly it involved a lot of falling over too. 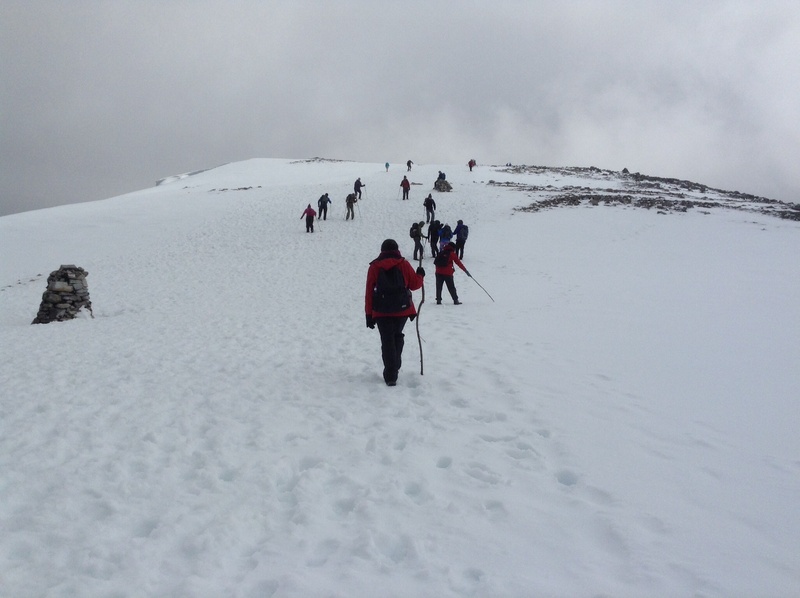 Once we passed the snow, the craggy boulder fields were a lot tougher – gravity was no longer our friend, and falling over was not an option. Hikers were still attempting the summit – foolhardy really, nothing could be seen up there anymore and frankly it was very dangerous. 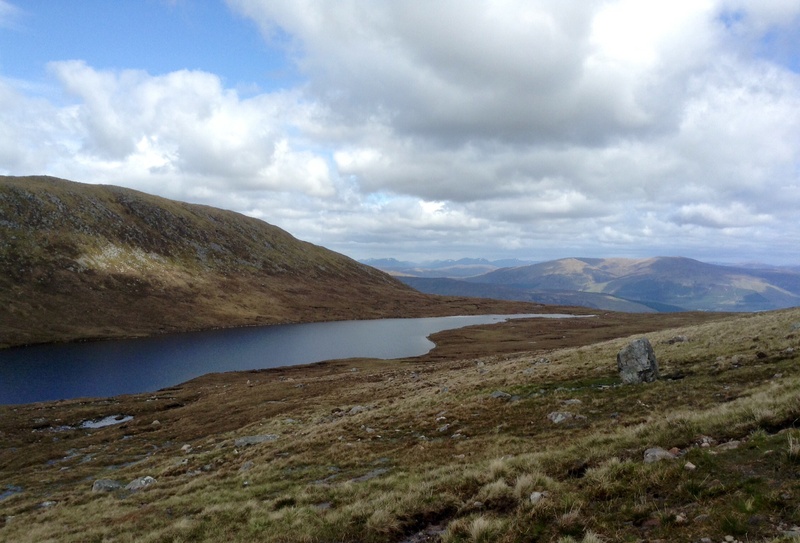 At last we safely navigated our way down beyond the snowline, and the way became easier all the way to Lochan Meall. The mountain range, the valley, the clouds, in all their awesome nobility – each distinct, each in harmony. We finally meandered down the ‘short-cut’ like little ants on the foot of a giant. As we reached the bottom, my friends stuck their trusty walking sticks – the very ones they had found among the fallen branches in the woods – in the mud. The three sticks stood proudly in the ground like battle-hardened soldiers: the next morning we saw other hikers pick up the sticks as they began their climb up – hopefully they and others got good mileage out of them 🙂 . 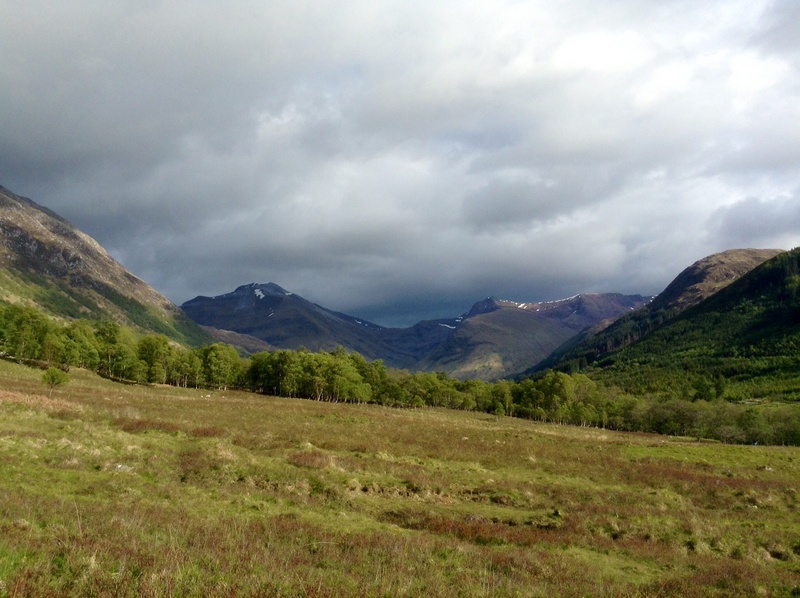 …With a last look at the mountain, we crossed the bridge over the River Nevis and headed back to the hostel with big smiles. Mission accomplished! We had begun at 9.15am and got back by 7pm. Overall the hike took us 2 hours longer than suggested on the visitors’ info board – this was partly due to the heavy snow at the top, but also because we were quite liberal with our breaks. We wanted to enjoy the views, and go at a decent pace for the whole group – for two of my friends it was the first time they had ever trekked up a mountain, so some parts were slow-going. Group dynamics and weather are both things that need to be factored in when doing a mountain trek. I’m glad we took our time, because we had the chance to really take in the views and savour the tranquility on the mountain. 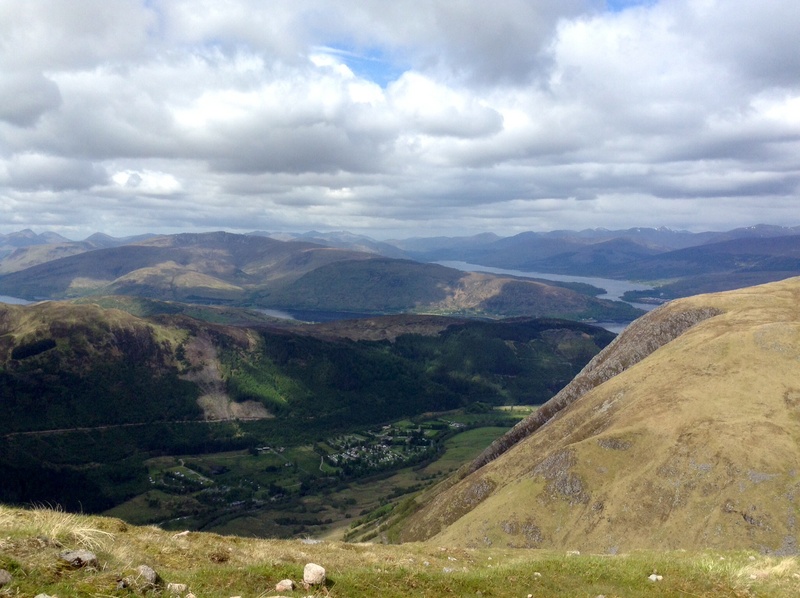 Respect to Ben Nevis, it ranks as one of the best hiking experiences I’ve had. 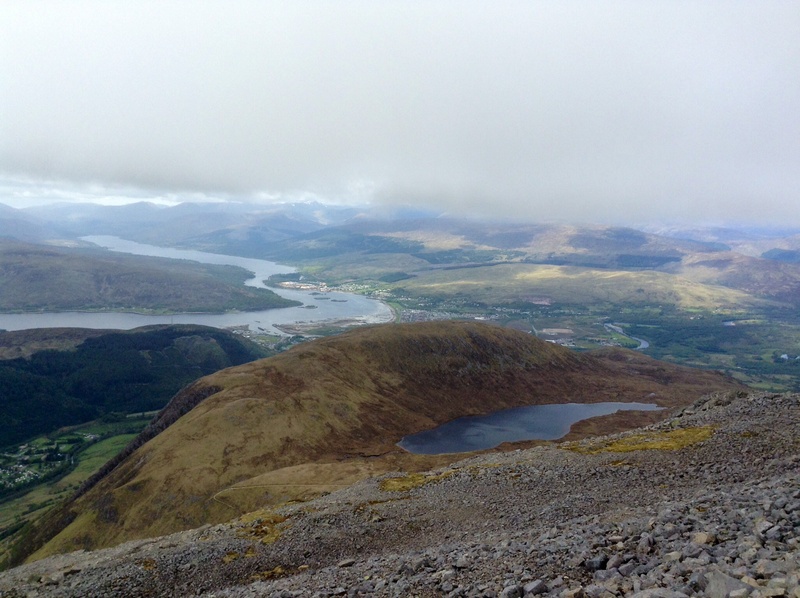 This entry was posted in Hiking, Nature and tagged Ben Nevis, Earth and Oak, Hiking, Landscape, Lochan Meall, Maps, Mountain, Munroes, My Photography, Nature, Outdoors, Scenery, Scotland, Scottish Highlands, Summit, Trekking, Waterfall. Bookmark the permalink. I hiked up Nevis a few years ago, in March, it was probably the coldest and wettest I have ever been on a walk, the top was snow covered and there was no view because of the thick cloud cover, lower down though the views were terrific. 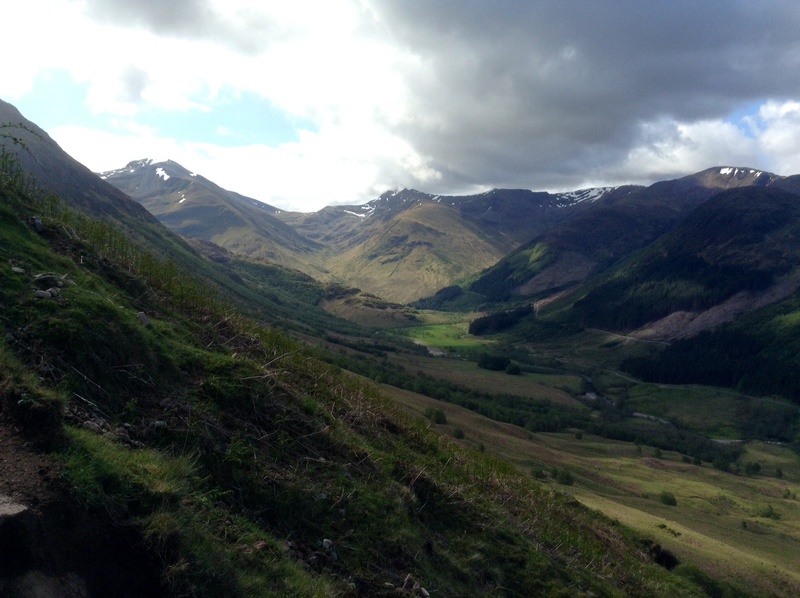 Thanks for your comment Elliot – your experience on Ben Nevis sounds like an epic, if somewhat challenging hike! Glad you were able to see the great views from lower down – you’re right, the scenery was terrific.